I am in the process of toilet-training our 3 cats. Yes, you read that correctly. Toilet-training. Cats. Three of them. I’m using these instructions that I found online and, though I’m a bit afraid to jinx it, it’s actually going well so far. I would be SO very happy to never have to clean a litter box again. I’ll keep you all posted, but in the meantime, please don’t ask me how it’s going. Oh, and maybe say a little prayer for me. I am DREAMING of this Balenciaga scarf. If I had one, I would wear it every day and snuggle with it every night. I would read it bedtime stories and blissfully ignore all of the controversy. 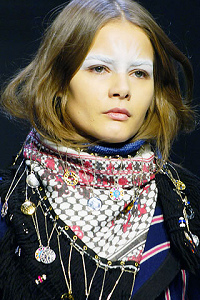 There have been other trends that I’ve lusted after before, but this one is keeping me awake at night. Boy, enjoying a warm samosa. When I saw this recipe in the new special edition Fine Cooking “Appetizers” magazine, I knew that I would have to try it. We LOVE Indian food, and especially samosas. We are attending a party soon where we are expected to bring an appetizer and this may very well be what we bring. These were WAY labor-intensive: I prepared the garam masala one day, cooked the potatoes the next and then prepared the dough and make the samosas the next. Whew! But…..they were REALLY good. My worst fear is that I didn’t seal the samosas well enough and that they would fall apart and the filling would come out when I fried them, but they didn’t! Yay! 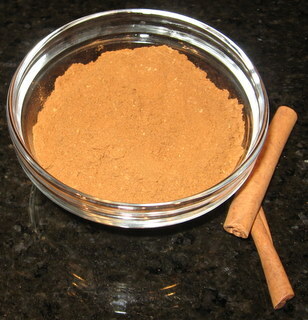 Garam Masala, toasting in a skillet. 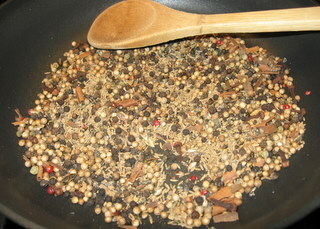 The peppercorns that I use are a mixture of different colors of pepper, so that’s what the red things are. I didn’t use the garam masala recipe that was in the recipe, but used this one, instead. They were similar enough that I don’t think it changed the flavor of the final product. 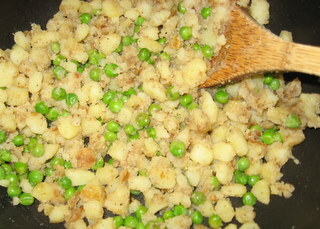 I used Yukon Gold potatoes, because that’s what we like and that’s what we had on hand. I also couldn’t bring myself to use shortening: it’s just not something that I keep in the house, so I used butter, both to brown the potatoes and to make the dough. I think this recipe called for just a BIT too much coriander. There’s already quite a lot of coriander in the garam masala, so I don’t think I’ll add the extra seeds to the filling next time. 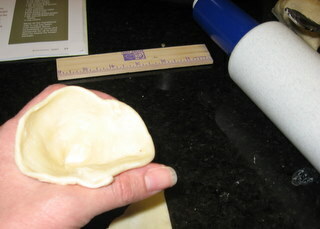 Forming the dough into a “cone”. 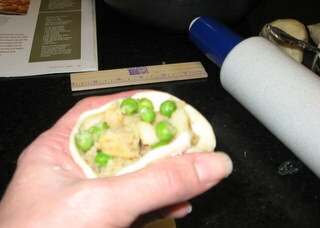 Stuffing filling into a dough “cone”. I was afraid to stuff the samosas too full, for fear that the dough would rip, but they are really better when they are stuffed full of the potato-pea filling, and don’t have any empty “air space” in them. It turns out that the dough is much less fragile than I feared, so stuffing them pretty full is OK. 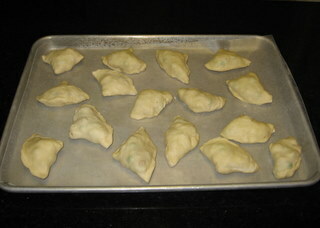 Formed and filled samosas – can you tell which ones I did last, after some practice? 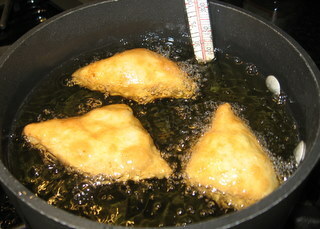 Samosas, frying. 350 degrees for 5 minutes was PERFECT. It was hard to turn the samosas over; they had a tendency to want to stay the way that you first put them in and would flip back over when I tried to turn them. The finished plate of samosas (minus the two that Hubby and I ate before we took the photo). 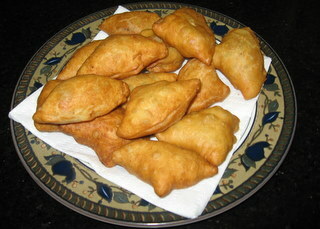 I would HIGHLY recommend this recipe for anyone that loves samosas but hasn’t tried making them before. I would also highly recommend buying the “Appetizers” magazine – it has a lot more great recipes in it to get ready for upcoming holiday gatherings. NB: I adapted this recipe from one that was published in Southern Living magazine many years ago. I didn’t notice, originally, that this recipe requires 8 hours of refrigeration before baking and had planned to serve this for last night’s dinner. 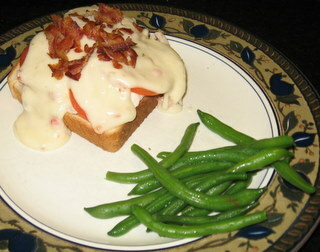 Luckily, I had the ingredients on hand for the “comes together quickly” Hot Brown sandwiches and we had those instead. So, don’t make the same mistake that I did: be sure that you start preparing this at least 9 hours before you want to eat it! Also, the original recipe called for thawed frozen broccoli florets, instead, so feel free to substitute – thawed frozen spinach might be good, too (squeeze out all of the excess water first). A small sprinkle of your favorite herb would also be a nice addition. Spray 9 X 13-inch baking pan with cooking spray. Saute celery in the butter in a small saucepan. 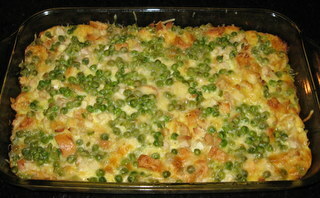 Layer half each of bread cubes, turkey, peas, celery and cheddar cheese in pan; repeat layers, ending with cheese. Whisk together eggs and remaining ingredients in a large bowl; pour evenly over cheese, pressing down lightly to absorb liquid. Cover and chill 8 hours. Remove from fridge and uncover. Bake at 350 degrees for 45 minutes or until golden. Let stand 10 minutes before cutting into serving-sized pieces. Layer the ingredients, as directed, into custard cups (7 of them, 10 ounces each) instead of the baking pan, to make individual serving cups. Bake for just 30 minutes. I had not ever had these before and have really only heard them mentioned in conjunction with burgoo and juleps, as a Kentucky Derby food, but when I saw both Cooking Light and Epicurious plugging them as a good use for leftover turkey, I had to give them a try. I combined the parts of both recipes that appealed to me to make this version, which was a big hit with all 4 of us. We bought our smoked turkey from a wonderful local BBQ place called The Salt Lick. In a small saucepan, cook the onion in the butter over moderate heat, stirring, until it is softened. Whisk in the flour and cook, whisking, for 3 minutes. Slowly pour in the milk, whisking to combine, until the mixture is thick and smooth. Add the cayenne, sherry, salt and pepper to taste and simmer, stirring occasionally, for 10 to 15 minutes or until sauce is thickened. Stir in the cheddar cheese, stirring until the mixture is smooth and thick. Place the toasts on a baking pan or cookie sheet. Top toasts with turkey, then tomato slices, then some of the cheese sauce. Sprinkle with the bacon and Parmesan cheese and broil for a couple of minutes, until warmed through and bubbly (watch carefully so that the bacon doesn’t burn). 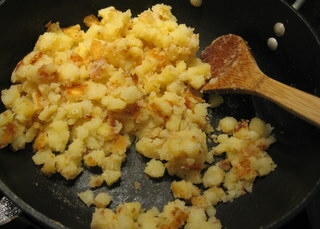 Remove from pan with a large spatula and serve. These would probably be good with ham, too, instead of the turkey. We had a great Turkey day meal yesterday. We went to Hubby’s mom and stepdad’s house. Everyone in Hubby’s family loves to cook and is really good at it, so everyone brings a potluck dish to share and we rotate from house to house each year. I had signed on to bring a salad, but ended up bringing a baked brie appetizer (scroll down for the recipe), a butternut squash spread appetizer and some pumpkin eclairs, too (like I said, we all like to cook). 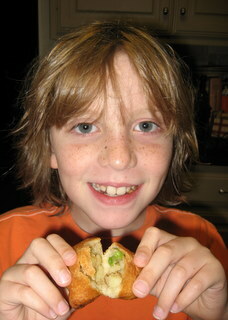 This food-a-philia has also apparently been passed on to the next generation. The kids (well, the girl cousins, anyway) set up a hot beverage stand with homemade Mexican hot cocoa (semi-secret ingredient: REAL Mexican vanilla and a touch of cinnamon) and made-to-order coffees (we brought our Capresso machine). The drinks were customized with marshmallows, sprinkles of cinnamon and/or chocolate, squirts of whipped cream, etc. One gourmand grandfather suggested that the girls should also be offering Kahlua, Bailey’s, etc, but we were unprepared. Maybe next year. We wanted to continue the festive holiday food atmosphere this morning, so I decided to make this recipe. I served them with melted strawberry preserves (thinned with a bit of apple juice) and a squirt of whipping cream leftover from the girls’ hot beverage stand. I’ve had crepes on my mind recently, because there’s a little crepe place not far from us that is getting some great reviews lately, but I wasn’t sure if it would be open this morning and also, it’s in a little Airstream trailer, with adjacent outdoor seating, and I thought that it would be too COLD this morning! These were a great stand-in, though, and were very easy (my mom used to make crepes when I was little, so I’d seen it done before, but it had been YEARS). I didn’t have any plain brandy in the house, so I used apple brandy. Hubby and I really liked them and Boy liked them okay, though he wasn’t wild about them. I think this may be due to the fact that he’s not a fan of strawberry preserves. Girl really liked them and cleaned her plate, but said “Mom, something in these tastes the way that nail polish remover smells”. Umm, I’m guessing that would be the brandy. Of course, the alcohol was all cooked out, but I will still probably look for a non-alcoholic version the next time that I make crepes. 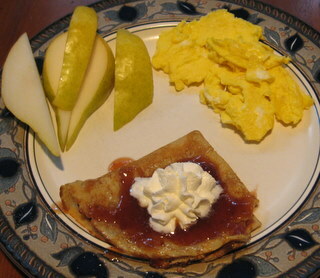 I’m going to experiment soon with some savory crepe fillings, too (maybe leftover turkey?). 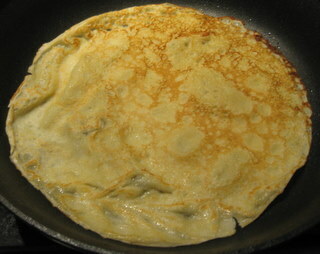 Crepe, cooking, in the pan. Mix all ingredients together until blended. Store spice in a tightly lidded glass jar or small airtight plastic container. We use this mixture in just about anything that calls for cinnamon. It’s great when mixed with sugar to use for cinnamon toast. Sprinkle it in your coffee (or on top of the foam if you have a “fancy” machine) or over hot cereal and oatmeal. We love it in pancakes, beignets, or any other baked good recipe. This recipe is adapted from an old Pillsbury recipe booklet (the kind that you see at the supermarket checkout). They turned out pretty yummy, even though I didn’t bake them quite long enough. I also made them too long the first time, so if you follow the recipe exactly, yours will look half as long as the ones in the photo. I’m probably going to bake another batch for Thanksgiving, so I’ll have another shot to get them PERFECT. In a stand mixer, combine the brown sugar, butter, vanilla and egg; beat until light and fluffy. Add flour and 3/4 tsp of the cinnamon spice blend; mix well until dough forms a ball. 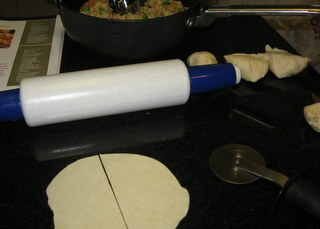 Flatten the ball of dough slightly, until it forms a disk, wrap in plastic wrap and refrigerate for about an hour. Heat oven to 350 degrees. On a lightly floured surface, roll the dough out into a square about 12 X 12 inches. Cut dough into 1 X 3 inch strips with a pastry wheel or sharp knife, using a clean ruler as a guide. 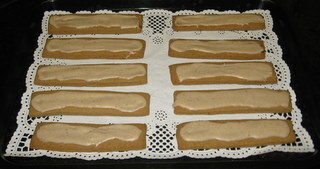 Place sticks 1/2 apart on parchment-lined cookie sheets. Bake at 350 degrees for 12 – 15 minutes or until edges are browning slightly. Immediately remove from cookie sheets. Set aside to cool completely. Meanwhile, in a small bowl, blend powdered sugar and remaining 1/2 tsp of spice blend, starting out with 2 Tbsp. apple juice, until smooth, adding more apple juice, if needed, for desired glaze consistency. Spread glaze on tops of cookies. Let stand until glaze is set before storing. Mix all ingredients together until blended. Store leftover spice in a tightly lidded glass jar or small airtight plastic container. We use this mixture in just about anything that calls for cinnamon. It’s great when mixed with sugar to use for cinnamon toast. 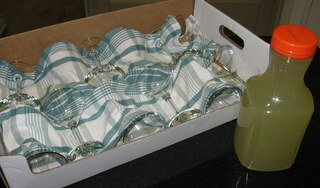 A batch of my burgeoningly famous Basil-Lime martinis, packed and ready for a friend’s recent party. I usually bring the glasses, too, because these are so potent that it’s best to keep the serving size small (refills don’t count, right?). Lately, I get asked to bring these to potluck functions, instead of food. Should I be offended? This recipe, from Cooking Light magazine, is really easy and is actually pretty tasty. 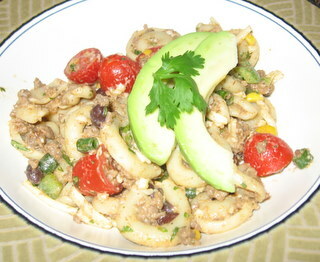 Gourmet, it’s not, and it’s not terribly picturesque on the plate, but it is quick, kid-friendly and pretty healthy. Let me say however, that this recipe makes an OBSCENE amount, so, unless you’re having a party or have 8 kids, you should cut the batch in half (which would be easy to do). Learn from my mistake – we’re going to be eating this stuff for days. – I added 1 cup of frozen corn, zapped in the microwave for a couple of minutes to thaw, and then drained. – I used cappelletti pasta, because I had it on hand and the only radiatore that I could find was HUGE and not even close to being bite-sized. – I used ground beef, instead of turkey (ditto – I had it on hand). – I garnished with a bit of sliced avocado and a cilantro leaf. – I left out the olives, because 3/4 of us don’t like them (Boy loves them, so I planned to add some as a garnish on his portion). – I used halved grape tomatoes instead of the chopped tomato. This was a big hit with Hubby, who will eat anything that’s even moderately “Tex-Mex-y”. Girl loved it, too. Boy was at a birthday party, where he had already eaten a burger, so he ended up not eating with us tonight. I think he’s also coming down with something, poor guy. If he makes it to school tomorrow, he’ll be having some of the leftovers in his lunch.